Russia has published its first ever rating of ethnic tensions in the regions. According to the study, the situation is the most acute in Moscow, St. Petersburg, Dagestan, The Stavropol Territory, and the Republic of Tatarstan. The report cites uncontrolled immigration, socio-economic depression and lack of a coherent ethnic policy as causes of tension. 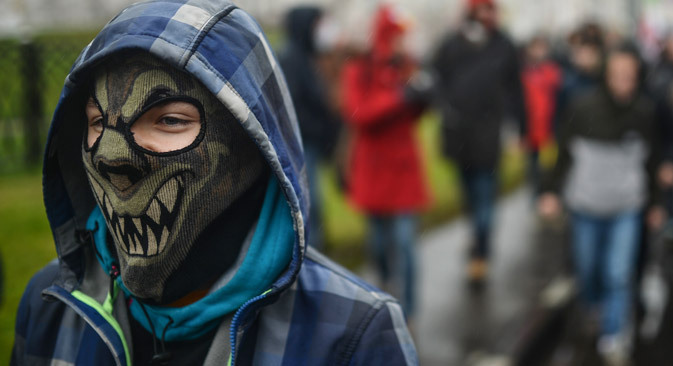 Russia has published its first ever rating of ethnic tensions in the regions. According to the study, the situation is the most acute in Moscow, St Petersburg, Dagestan, The Stavropol Territory, and the Republic of Tatarstan. The authors of the rating have calculated that between September 2013 and March 2014, there were 570 "ethnically motivated actions" committed in Russia, mainly caused by uncontrolled immigration, socio-economic depression and lack of a coherent ethnic policy. Russian society remains divided; socially, ideologically, culturally, and ethnically. The problem of separatism has been replaced by a new threat, that of a rise in xenophobia. It is a study of this problem that has prompted the "Grapes of Wrath" rating, a non-political project developed by the Center for Ethnic Conflict Studies together with a federal information agency, the Regions' Club. The main causes of ethnic tensions, according to the authors of the rating, are uncontrolled immigration and the lack of a coherent ethnic policy, as well as a lack of both awareness about the real situation and cross-cultural communication. A separate strand identified by the experts is presented by economically depressed regions, where a rise in nationalism is inevitable, irrespective of the ethnic make-up of the population. An interactive map, summing up the findings of the study, color-codes all Russian regions into five groups: from red, indicating the highest tension, to blue, marking the regions where the situation is the calmest. The "red" rating was given to Moscow, St Petersburg, Dagestan, the Stavropol Territory, and Tatarstan. In those regions, "numerous incidents of mass violence" on ethnic grounds have been recorded. The "blue" regions include republics with a complex ethnic mix, such as the Kabardino-Balkar and Karachay-Cherkess republics, as well as Chechnya, Kalmykia, Khakassia, and Mordovia. Experts point out that the global trend of demographic pressure from the poor agrarian south to the more prosperous industrial north is evident in Russia too. Global Islamization is having a direct effect on the situation in the Russian regions, and not only the predominantly Muslim ones. According to the head of the Regions' Club, Sergei Starovoitov, half of the experts believe that another significant factor provoking a rise in ethnic tensions is "the phenomenon of ethnic crime". The group of experts who compiled the Grapes of Wrath rating point out that Moscow is attractive for immigrants due to its high level of economic development and employment opportunities. At the same time, the Russian capital has all the conditions for ethnic conflicts to arise: high population density, high social stratification, extremely high dynamics of political processes[AG1] , and a high crime rate. The experts conclude that Moscow is the only city in Russia where ethnic ghettos may emerge. "Protest sentiments in Moscow will only continue to grow. Members of some ethnic communities in private conversations go so far as to suggest that there may even be interethnic wars," says Oleg Atmashkin, head of Ethnology Project, a center for promoting world cultures. In addition, the authors of the study point out that a destabilization of the situation in Moscow would lead to a rise in tensions across the whole country. St. Petersburg is the second most popular destination for immigrants. Its distinctive feature is a high degree of aggression: If in Moscow conflicts often become political or develop into a media story, in St Petersburg they often take the form of local clashes that fall under the radar of the media and often end in casualties. The study has concluded that the North Caucasus is having a negative effect on the nearby regions, while the Volga region has an "independent hotbed of tensions". The risk zone includes several Siberian regions, where the spread of radical Islam among immigrants may become a destabilizing factor; and several regions of the Russian Far East, where the presence of immigrants and seasonal workers from China poses a serious threat to social harmony. In the next rating, which is due to be published in the fall of 2014, the authors will seek to develop key recommendations for the authorities of those regions that face problems with ethnic tensions. It is expected that the Republic of Crimea may feature in the "risk zone". Starovoitov predicts that in the next rating, the new constituent part of the Russian Federation "is sure to be placed somewhere between the orange and yellow regions".